Home > Health	> Are used breast milk pumps safe? Are used breast milk pumps safe? The invention of the electric breast milk pump has given breastfeeding mothers more freedom, less pain and more flexibility in providing breast milk to the child. There are many benefits from using the pump – storage of breast milk has become possible for future use when the mother is not available for the child ie. during at work, stimulation of milk production, easing the pain of fullness of the breast due to engorgement from the milk and a schedule in which the mother can rest at night. On a serious note, there are many mothers who sell used breast milk pumps online. DO NOT BUY OR USE used breast milk pumps unless it has been approved by the FDA for multiple use and that the mother has her own collection kit. Used breast milk pumps not approved by the FDA for multiple use are NOT SAFE. They are a health hazard to the baby. Period. Some advertise that it is safe to use since the parts that comes in contact with the person and breast milk can be purchased separately online. This is NOT true. They fail to account for the microscopic droplets carried through the air in the tubes to the pump mechanism. This area can harbor bacteria, viruses and even fungi (causing candidiasis-oral thrush). The FDA states that “Only FDA cleared, hospital-grade pumps should be used by more than one person”. However, the FDA has approved two “personal use” breast milk pumps for multiple use. Breast milk can carry bacteria and viruses – HIV, hepatitis and cytomegalovirus. Hospital-grade pumps utilizes a “closed-system” so that there is no possible way for breast milk to enter into the pumping mechanisms. The portion of the parts that are exposed to breast milk particles are all purchased separately so that there will be no concern of cross contamination between mothers. 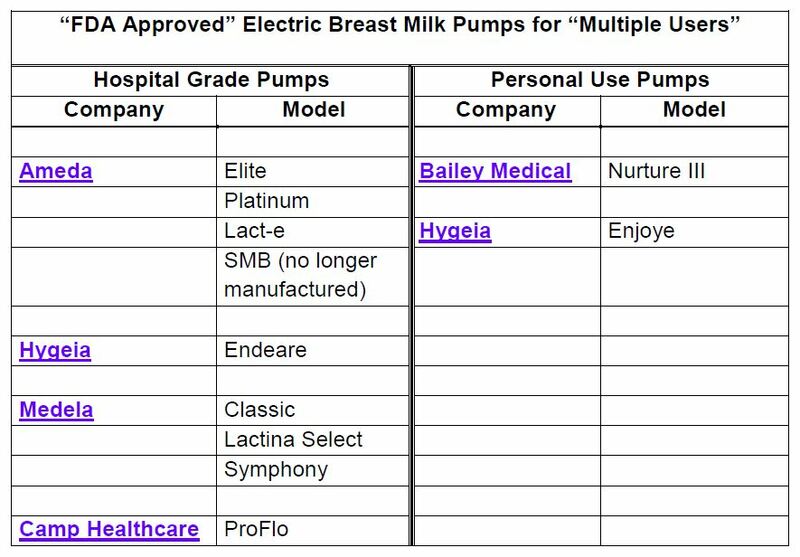 Here is the current list of “FDA approved” electric breast milk pumps for multiple users. Are used breast milk pumps safe? The best way to be sure is to contact the manufacturer and ask them directly whether they are approved by the FDA for multiple use. Are Optical Brighteners in Baby’s Clothing Safe? Happy 50th Birthday Sophie!